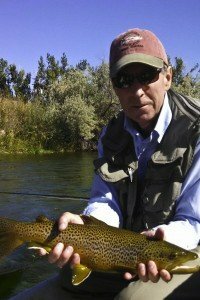 Bighorn River Wyoming Fly Fishing Guide Report: The fly fishing in Thermopolis remains to be great. Weather was very nice this weekend with crisp fall mornings and warm blue-bird afternoons. Guide Spike and Michael had a fantastic day yesterday tricking trout with dry fly and nymph set ups. Looks like we traded blue wing olives for tricos with the nice weather. Pretty typical but the trout seem to be very picky on natural dries, so cast and hook set all must be precise to seal the deal. The nymph fishing has been much more consistent and producing big numbers. 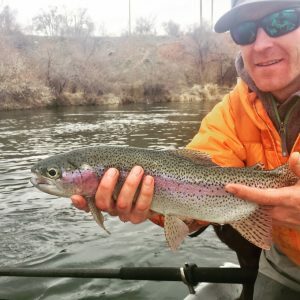 Dunoir Fishing Adventure’s fishing guides have been working hard in Dubois and Thermopolis, Wyoming guiding on the alpine lakes and the Bighorn River. 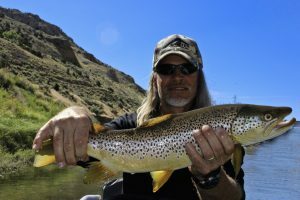 We are in our peak season for guests and making sure all of our guests have a fly fishing adventure of a lifetime. 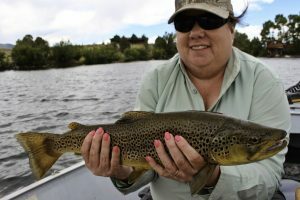 The fishing has remained good to great despite our big water on the rivers. 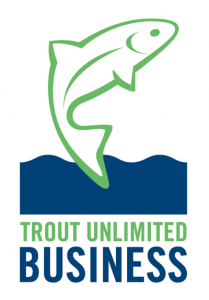 Guests have been catching rainbows, cutthroats, browns, and even lake trout. Hot flies lately have been a few foam terrestrials, tricos, streamers, and baetis nymphs. It is the season of the dry-dropper set-ups! The Bighorn River flows have been bumped up to 3750 cfs yesterday, which is up from 2000 cfs a few weeks ago. My family and I enjoyed a day off at Brooks Lake fly fishing in Dubois a few days ago. 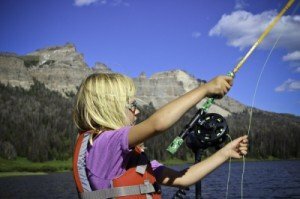 Little Meesha is showing promise of becoming a great fly angler and is perfecting her cast. 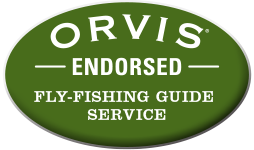 Keep posted for more fishing reports to come.